Just what the doctors ordered! Gary Faigin was the featured Guest Speaker at the fall conference of plastic and reconstructive eye surgeons (ASOPRS) in New Orleans in November 2017. While Faigin may obsess over the finer details of lids and brows in his drawings, the conference attendees are surgical artists who do the same work in a much messier medium. You want them to get it right when they repair orbital blow-out fractures and reconstruct upper eyelid defects! ​Faigin's presentation, "A Demonstration of Drawing Vivid Expressions," was done completely with digital drawings produced in real time on a tablet. He focused on the effect of smiling mouths on the action of the eyes and eyebrows, showing both good and bad examples with multi-layered drawings projected onto three giant screens for 800 medical professionals to watch.! Faigin, with his artistic explanation of the elements of facial expression, provided a useful new perspective for these specialized eye surgeons to add to the tools in their doctors' bags. "The crowd was thrilled by Gary's presentation." Faigin Gary; Leber, David C. M.D. The Artist’s Complete Guide to Facial Expression. Edited by Gary Faigin. Pp. 288. Watson-Guptill Publishers, New York, N.Y., 1990. Price: $35.00. As plastic surgeons, we are all familiar with the muscles of facial expression, their anatomy, and their function. Very few of us are truly aware of the precise position and interaction of the facial muscles as they influence the position of the eyelids, eyebrows, and mouth, conveying expressions of emotion. Gary Faigin, a recognized painter, printmaker, and art teacher, has combined his own extensive research on cadavers, photographs, and works of art with information from anatomists, psychologists, and anthropologists to produce a book that is a first of its kind. With the aid of 400 black-and-white illustrations and photographs, the individual components of the six fundamental facial expressions—anger, joy, sadness, fear, disgust, and surprise—are clearly depicted and explained. From these six basic expressions, all other facial expressions are derived. The early chapters are devoted to normal facial proportions, anatomy, and function of the facial muscles. Important references are given for the normal resting positions of the eyelids and lips and the limits of their normal range of motion. 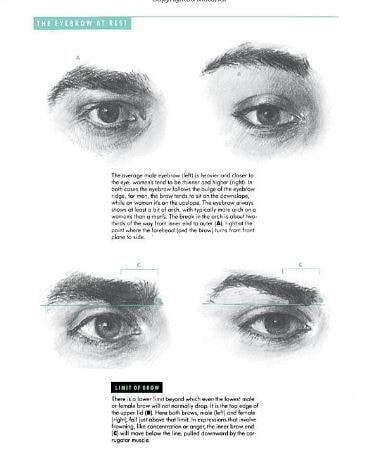 Succeeding chapters describe in detail the six basic expressions of the face, explaining which facial muscles are used for each expression and the positions assumed by the eyelids, eyebrows, and mouth. The key elements of 47 common expressions are included. 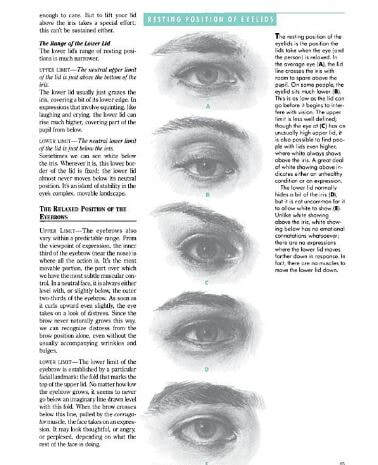 The Artist’s Complete Guide to Facial Expression was written primarlily as a reference for artists, but I would strongly recommend it as a reference guide to all plastic surgeons and any surgeon who performs surgery on the eyelids and lips and expecially those interested in facial reanimation. The differences between a joyful face and a sad face can be very subtle. With the excellent illustrations and concise text, I believe this book can aid us in the facial analysis of our patients and possibly improve our surgical results through better insight.